SALT LAKE CITY — Next stop on the Brandon Clarke Dunk 'n Swat Festival: The Sweet 16. 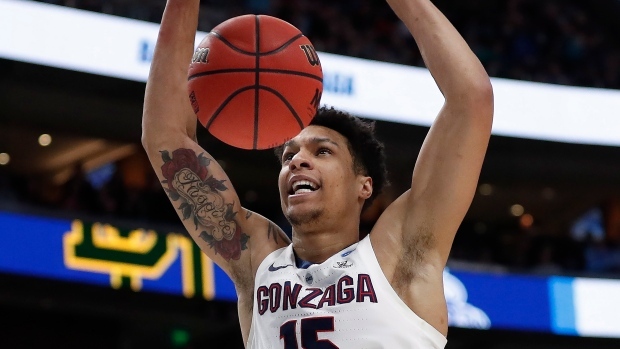 The Gonzaga forward from Vancouver had five monster dunks, five blocks, matched a career-high with 36 points and enjoyed the overall kind of night that earns potential NBAers millions, while leading the top-seeded Bulldogs to an 83-71 rejection of Baylor on Saturday. "Is 'Wow' the word you say?" teammate Josh Perkins said. "Dunking the ball, blocking shots. He just plays the right way." This second-round matchup in the West Region wasn't exactly a blowout, but wasn't quite a nail-biter, either. That doesn't mean it lacked entertainment. Most of it centred on Clarke, the junior transfer from San Jose State, who started the fireworks with a windmill jam on a breakaway that gave Gonzaga an early 16-7 lead. Clark's final dunk of the first half came at the end of a 5-second clinic on how to deal with Baylor's floor-clogging 1-3-1 zone. Starting at the perimeter, all five Bulldogs touched the ball in the span of those 5 seconds; it ended with Killian Tillie's hook-flip to Clarke for a jam. It was as gorgeous a display of basketball as you'll see all year, and it put the Bulldogs ahead 35-16. "That's players having great feel for the game and just playing," coach Mark Few said. "He drew nine fouls," Drew said. "There's a reason he's on the draft board." It was the defensive prowess that put him on many of those boards, though there's been a pretty large spread in opinion about exactly where he might land if he leaves after this season. What he did on the offensive end in this game certainly won't hurt. He went 15 for 18 from the floor, and most of the shots were of the high-percentage variety. Clarke is the team's two-time reigning dunk champion. "If he'd made his free throws, he'd have had a 40-burger," Perkins said. Few said it was Corey Kispert, not Clarke, who was Gonzaga's player of the game. Kispert made his first four shots and went 6 for 8 on the way to a 16-point night. He also got called for a technical for taunting with 8:06 left. The free throws and an ensuing three-point play helped the Bears draw within eight, but they never got closer. Baylor's Mark Vital played much bigger than the 6-5 he's listed at. He carved out space inside and finished with 17 points and eight rebounds, but was hampered by foul trouble. He picked up his fourth with 16 minutes remaining and fouled out in the final seconds. "They're a really good team," Kispert said. "They're going to demand our best. But it's exactly what we wanted. We wouldn't want it any other way."